You could pretty much leave it at that, and many people would be quite satisfied … especially frequent visitors to the “pure” version of the genre, like the one that is closest to where I live, Cal’s Country Kitchen in Madison, TN, a suburb of Nashville. Cal’s is only open for lunch and there is nothing else on the menu except dessert. They are run by a small staff, located in an old house sort of behind Kroger and next to the Madison Lodge. The decorations aren’t fancy or expansive, but friend, your trip to Cal’s should be focused on the food, and probably the family or friend(s) you eat with. Cal’s is a solid “meat and three” and could be described by several terms: home cooking, country cooking, soul food, southern style, grandmaw’s cooking, etc. They are the quintessential version of what I would term a traditional meat-and-three restaurant. Cal’s is a model for the working definition mentioned above. 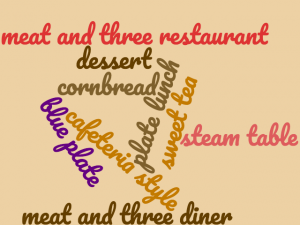 When talking about meat-and-threes, the terms “blue plate” or “lunch plate” are used as well as “steam table” and “cafeteria style”, and some folks like to include the buffets in this genre (although I don’t include buffets on this site). Additionally, one can’t forget the typical cornbread (or roll or biscuit) and sweet tea that are almost universally included in meat-and-threes, especially across the South. Like most things in our modern society, however, the “meat and three” is not always simple when taken “in toto”, as one of my accounting professors used to say. But that’s not necessarily a bad thing. As times have changed, new owners/cooks/chefs have taken the concept to new and different places. Palates have “evolved”, as well, and there are varied opinions about food, in general, which has led to many more options than the “traditional” version of the meat-and-three that I grew up with. In future posts, we’ll take a look at a variety of options in our new meat-and-three world, and I think you’ll enjoy the journey. Maybe you will venture out into the great unknown (USA page) and find some cool, new places in which to enjoy a great meal with friends, family, business associates, or maybe even a date. But, it’s my hope that we will also keep the doors wide open to the more traditional meat-and-three restaurants that, some have tried for years to say, are dead on the vine … but that we know are very much alive and thriving in many spots across the country.